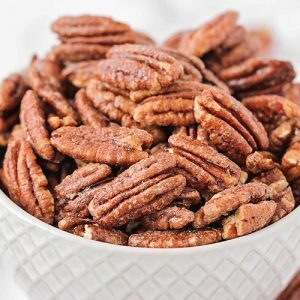 These delicious candied pecans recipe has a sweet crunch and a touch of cinnamon. They're perfect for holiday gifts or party snacks! Preheat the oven to 250. Line a baking sheet with parchment or a silicone liner and set aside. In a medium bowl, whisk together the egg white and water. Add the pecans to the bowl and toss to coat with the egg white mixture. Add the brown sugar, cinnamon, and cayenne, and toss until combined. Spread the pecans out in an even layer on the prepared baking sheet. Bake for 1 hour, stirring every fifteen minutes.